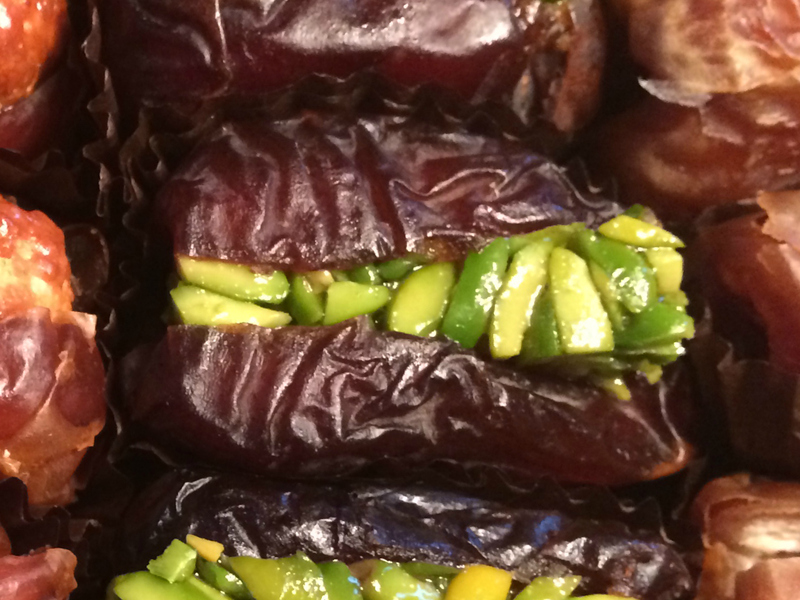 Soft, sweet dates stuffed with candied fruits and nuts. My husband recently went to Dubai on business and asked what I wanted him to bring back for me. My first thought was food, so I did some research to see what might be interesting. While gold, spices, and camel milk chocolate were all high on the list of recommended items to purchase in Dubai, what intrigued me most was what I read about the dates. Plump, sweet, gooey and delicious, the dates in Dubai are a whole different ballgame from the ones we find here. There is a certain status associated with dates in Dubai. They are served as a treat on special occasions and given as gifts in elaborate packaging. When my husband arrived at the top of the Burj Khalifa, he was presented with a particularly large fancy date that was topped with a cashew. Here they may be just another dried fruit, but in Dubai they are a delicacy. My husband went to Bateel, a popular date vendor located in the world famous Dubai Mall that features dates from all over the Middle East including neighboring Saudi Arabia, whose dates have the reputation of being the plumpest in the world. He came back with a very fancy gold box filled with stuffed dates and another box of assorted unadulterated dates of varying origins (as well as some camel milk chocolate, saffron, and a delicious Middle Eastern spice mix referred to as baharat that he picked up at the Spice Souk). 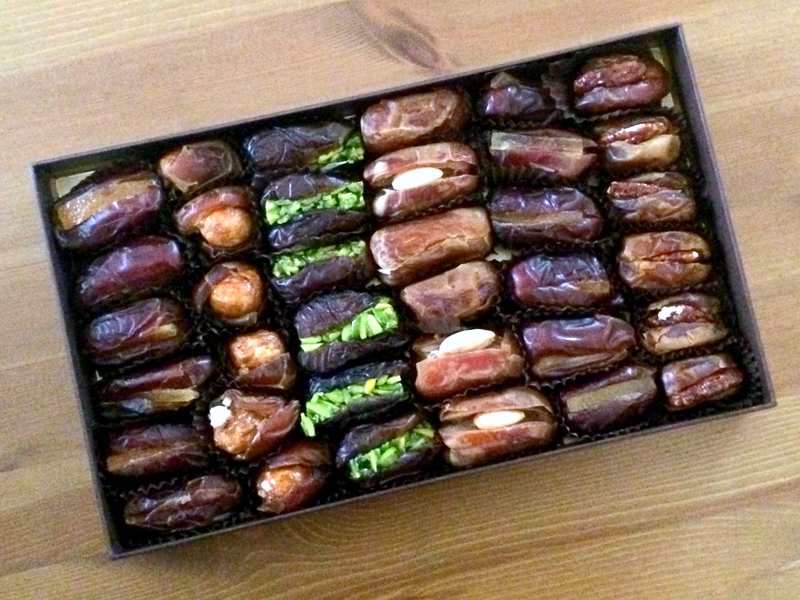 The dates were absolutely exquisite; succulent, sweet as candy, and more varied than those we have here. There were dates of different colors, sizes, and shapes, and each had it’s own flavour and texture. My favourites were the stuffed dates, which were also assorted and filled with delicious candied fruits and honeyed nuts. My husband and son liked the dates stuffed with candied orange peel the best, but my favorite were the ones filled with candied pistachios. The combination of the soft, plump, sugary dates with the crunchy green pistachios was like a piece of delicious homemade candy, only better. your husband selects travel gifts well 🙂 Those look over-the-moon amazing. What fun! Totally grown up candy. Better than chocolates, really. Dubai? Wow. I can so relate – right after lunch is when my sweet tooth comes out with a vengeance! 😉 Hope you found something delicious to satisfy it! You had me at candied pistachios.